Welcome to Himalayan Health Exchange. Our expeditions provide community health service and hands-on clinical experiences to our participants. Himalayan Health Exchange brings together healthcare professionals and students seeking a career in global health to provide care to the under-served populations in select, remote areas of the Indian Himalayas and Indo-Tibetan Borderlands. Each medical elective combines service, hands-on clinical experience and adventure. Travel to remote and ancient Buddhist sites provides a chance to experience the world’s highest mountain range, its natural environment, the people who live there and their culture. 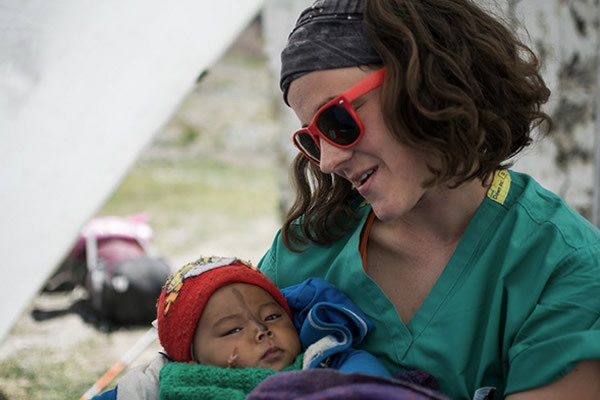 HHE expeditions allow residents and students to undertake medical electives by working in improvised clinics under the supervision of US-based and board certified physicians. Extended electives outside of the expedition dates are available for a limited number of participants for work in one of our five permanent clinics built to provide year-long continuity of healthcare to the local populations. Our annual expeditions cover all four regions of the Outer, Inner, Greater and Trans-Himalaya ranges in North India. Our annual anthropology field expedition incorporates medical anthropology, religious studies, Indian and Tibetan history and yoga within a clinical experience. Each year our team travels to Dharamsala and the Trans-Himalayan region of Spiti along the Indo-Tibetan borderlands, and provides free care and medicines to over 1000 patients.. Field visits to 9th century Buddhist monasteries and to Tibetan settlements provide an in-depth look at the ancient religious practices of Bon and Buddhism. The team roster combines anthropology and medical students who work closely with our anthropology professors and US-based physicians.